Safeguard Roofing Company is proud to serve South Florida’s roofing needs with more than 25 years experience, we have worked hard to achieve a well deserved reputation for superior work; work that always meets and often exceeds industry standards. Our Professional Roofing Company and Technicians and our Customer Service Staffs is the best in the business. Our fleet of vehicles, dump trucks, utility vans, stand at the ready to ensure a fast turnaround for your roofing job. each job is treated with the same careful attention that we would give to our own homes. The best means of protection in the sun, the rain and the snow is only under the roof of a house. If roofing is the prime need of your house, Safeguard roofing Company is there to serve you. Providing professional roofing services and quality repairing solutions to residential apartment dwellers and commercial building owners across South Florida better defines us and our objectivity. Roof installation, roof cleaning and roof maintenance are additional highlights of our roofing service at safeguardroofing.net. Safeguard Roofing Company, a leading South Florida roofing company is a hub of dedicated services from roofers, contractors and technicians under a single roof. Our contractors are easy to deal with and on go with the best of deals at competitive prices for you. Familiar with a myriad of roofing styles and designs, our roofers are most efficient and expert roof builders. They build rooftops with care to meeting your needs and commitment to meeting the deadline. Our technicians are always up with roofing repair solutions to address the problems associated with damaged roofs. Adding to our professional roofing company and quality repairing service is the advanced construction of new roofs, the complete maintenance of existing roofs and the flawless repairing of damaged roofs. Safeguard roofing company determines the structure and build of roofs based on an in-depth analysis of your needs and requirements. Apart from build, the beauty of rooftops is too a concern with Safeguard roofing contractors. We ensure constructional strength and aesthetic appeal of roofs for you. We are not only one roofing company contractor in South Florida. There are many far and wide. What keeps us ahead of them is a question the answer of which lies in the quality, excellence, perfection and coherence of our roofing and repairing services. We build not only roofs but also offer the best means of care for your house, residential or commercial. We use superlative quality and long-lasting roofing materials to convert your dream of a beautiful and durable rooftop into a concrete reality. Safeguard Roofing Company follows its own procedure to cater to your roofing needs. We take a hard long look at the location of your abode and its atmospheric conditions to choose the suitable roofing material for the safe and solid construction of your roof. We examine the construction several times to be sure of its solidity and ensure your satisfaction with our service. If we are your choice, it is an achievement for us. We promise to let you get the best of us. Safeguard Roofing Company is committed to giving every customer, large or small, the highest quality materials and attentive service. You just can’t beat our fair prices and excellent value. Call for a FREE ESTIMATE today and compare ! 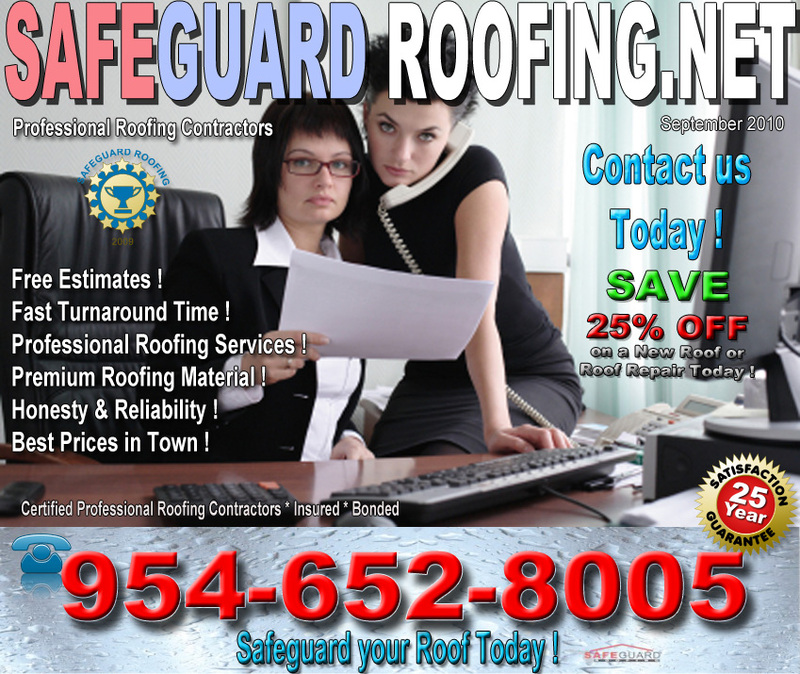 Safeguard Roofing of South Florida Inc.